The Bitcoin Foundation is launching a new series of events to support the future development of the cryptocurrency’s core. The first event for developers happens in Boston (United States) on 11th February. DevCore Boston is inviting “all developers interested in deepening their technical expertise to support the future development of Bitcoin core”. The meeting will take place at Boston’s District Hall from 8:30am to 4pm (EDT). “The biggest challenge for Bitcoin startups right now is finding technical talent who understands the blockchain technology. Whatever your skill level or interest, this event will give you a solid grounding in Bitcoin core and how you can contribute”, chief scientist of the Bitcoin Foundation Gavin Andresen said. Whatever your skill level or interest, this event will give you a solid grounding in Bitcoin core and how you can contribute. Besides Gavin Andresen’s key talk titled ‘What Satoshi Didn’t Know’, the Boston event will include a workshop about ‘Quick Hacks’, along with “practical hands-on training and technical certification”. The schedule also mentions consulting sessions with law firm Pillsbury Winthrop Shaw Pittman, panel discussions and an in-depth Q&A with Bitcoin core developers. Jeremy Allaire and Sean Neville, CEO and CTO of the Bitcoin platform Circle (the event’s title sponsor), will also be delivering a joint feature presentation during the day. According to Neville, “Bitcoin’s ongoing maturity toward massive mainstream volume depends on attracting more people to code, test, debate and generally innovate in its open meritocracy. These roundtables help developers cross that threshold”. The series of events was announced after the Bitcoin Foundation declared last year that it was planning to focus on core development, therefore reducing other activities. 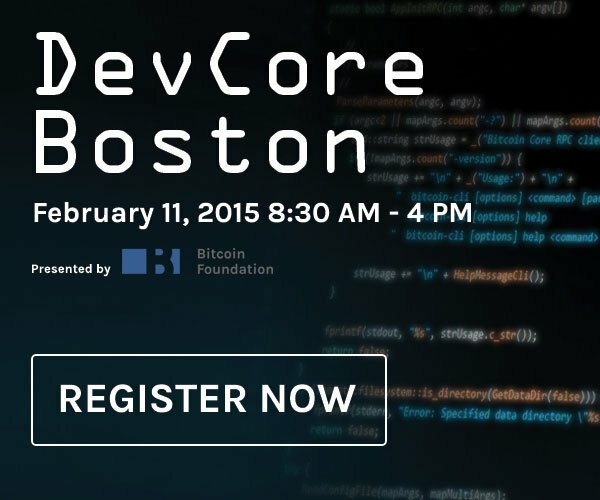 If you’re interested in participating in the DevCore Boston event, you can register here. Standard registration costs $125, while Bitcoin Foundation members pay $99 and students only $25.